Meet this week’s Backed by QuickBooks recipient! Throughout the month, QuickBooks® is spontaneously funding small businesses on crowdfunding platforms as part of our Backed by QuickBooks program. So far, we have funded four lucky businesses, including a butcher shop in New Jersey; a mompreneur from Tacoma, WA; a cosmetics company in Philadelphia, PA; and a soap company from New York. This week, we funded a frozen pop shop from Fort Worth, TX. Alchemy Pops is an artisanal frozen pop company that was started by Carolyn Phillips in 2015. 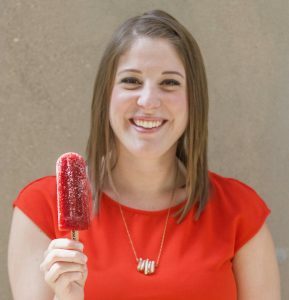 Leveraging local and seasonal fruits and flavors, Carolyn captures the taste of Texas in her pops and has been selling them via food cart and through her catering business that operates out of rented kitchen space. Alchemy Pops have become a staple in Fort Worth and earlier this fall Carolyn started a Kickstarter campaign to open Alchemy Pop’s first ever brick and mortar Pop Shop on Main Street. Click on the arrow below to watch a special video. There are only a few more chances for businesses to be Backed by QuickBooks this month, so keep checking back to see which lucky businesses get selected!